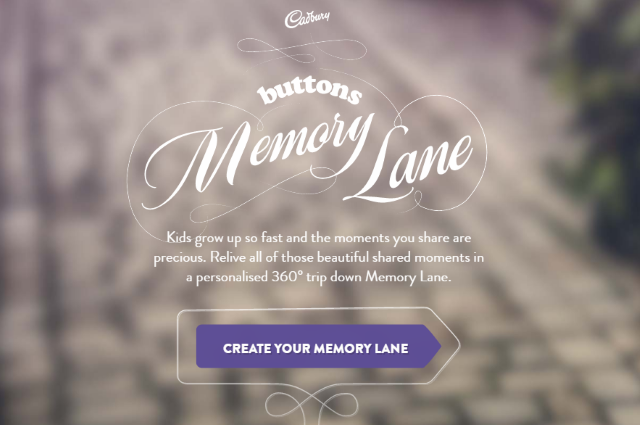 I was recently asked by Channel Mum and Cadbury Dairy Milk Buttons to create a video about a new online tool called Memory Lane. Although I've made a few videos with Lile and Sábha and have even done some TV presenting in the past, it was actually quite a challenge for me to get comfortable talking to the camera (aka vlogging) by myself. I usually just shove the kids in front of the camera and get them to do all the hard work! I have to say, though, I really enjoyed the process and, hope to make more videos like this. I really hope you like it too! I really liked the Memory Lane tool. It's a brilliant way to both save and share those photos you snap on a day to day basis and, because of the 360° technology used to create the personalised video - it's really fun to play with! I used a few family photos (you can add up to seven) for the video. None of the pictures were taken on particularly 'special' days out. For example; one picture is of Sábha and I on a walk together, another is of Devo and Lile drawing at the kitchen table and yet another is of us all huddled under a shelter to avoid the rain. These are the types of photos you might never think to print out or display, but are usually taken at moments of shared joy (why else would you take the picture?!) so they're probably worth remembering far more than the 'posed' ones. It was really lovely to see the girls' reactions to the video as they realised that they could see 'us' all over 'Memory Lane'. It also got them talking about some of the moments in the pictures and I've since been made to promise Sábha another 'climbing a mountain' date! Anyone can log into www.buttonsmemorylane.co.uk and make their own video. I'd love to see what you create and so would Cadbury Buttons and Channel Mum! Share your video using #ButtonsMemoryLane and you could be in with a chance to win some amazing prizes. See the description box below the video in YouTube for more details and all the Ts&Cs etc. Also, if you'd like to see more of our videos, please SUBSCRIBE to our YouTube Channel!! It's quite new and I'm still getting to grips with it as a platform but I'm really having fun with it and I'd love to see you over there. Thanks!